Thanks for joining me for Day Two of Fall Cookie Week. I hope you liked yesterday’s Chocolate Cherry Cookies. This afternoon I finally finished up with my sixth batch of cookies. Bakingso many cookies has seriously sapped my energy. You’d think all of the sugar would have the opposite effect. For some reason, I’m a glutton for punishment. At some point, probably during my brainstorming session, I decided that in between my guests, a gift shoppe open house, a room renovation, and about a million other things, baking six different types of cookies was a great idea. Oy vey!! 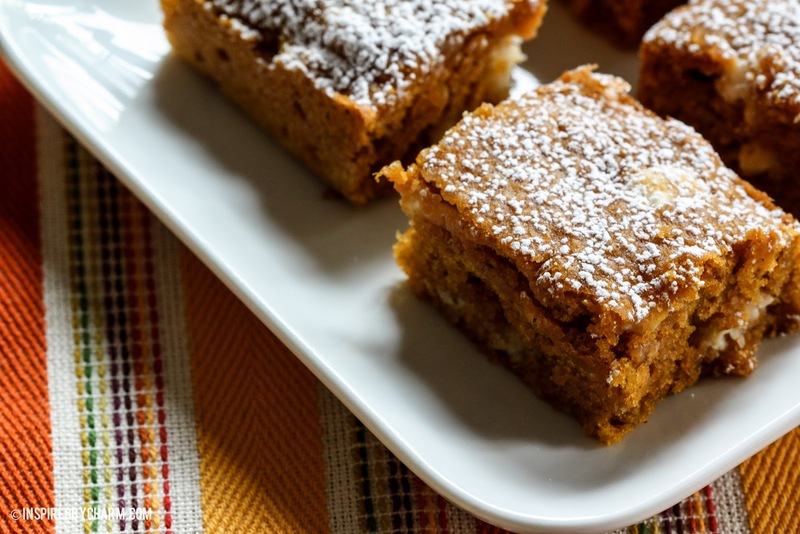 Though it’s debatable whether today’s cookie is actually a cookie, I’m sharing my recipe for Pumpkin Blondies. I started with a basic recipe from About.com and added pumpkin and spices. That’s what I love about pumpkin and baking. Because of it’s consistency, you can add pumpkin to almost any standard recipe and it’s ready for fall! ***Please note, based on several comments, it seems that this recipe only works in my kitchen. I’ve made this twice, with amazing results. I’m not 100% why it’s not working for other people. I was going to delete this recipe entirely, but ultimately decided to leave it, but add this warning. There is a good chance this recipe may result in a big pile of goop. You may want to add more flour or increase the cooking time based on your own cooking experience. Proceed with caution. Preheat your oven to 350 degrees F and lightly grease and flour a 13×9-inch baking pan. 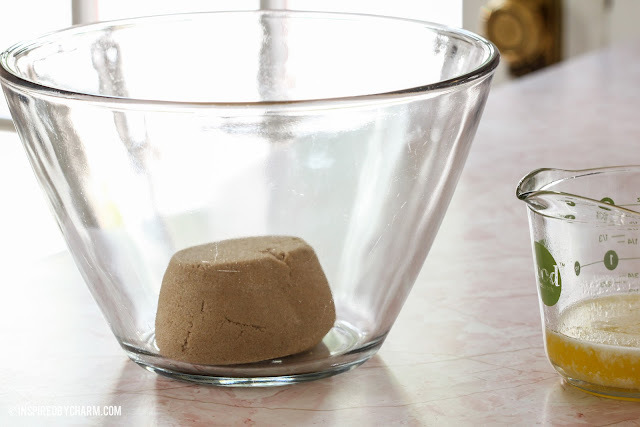 In a large bowl, mix together butter and brown sugar. Set aside. 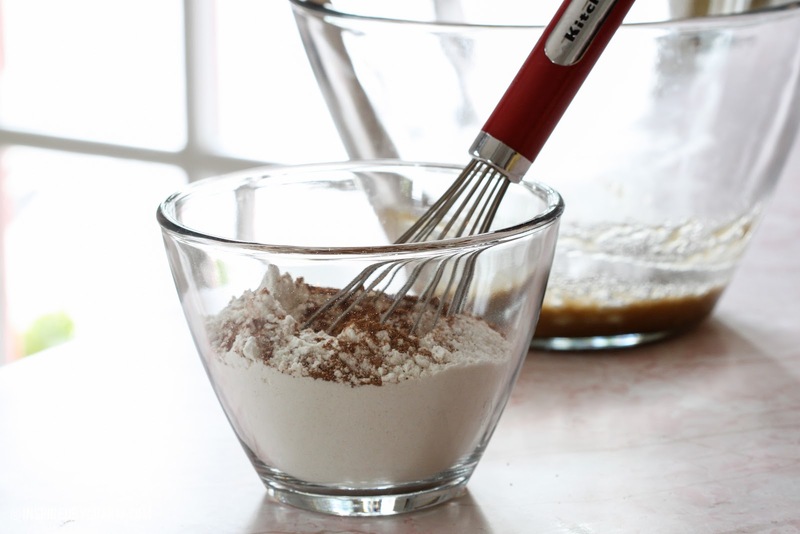 In a medium bowl, whisk together flour, baking powder, baking soda, spices, and salt. Set aside. 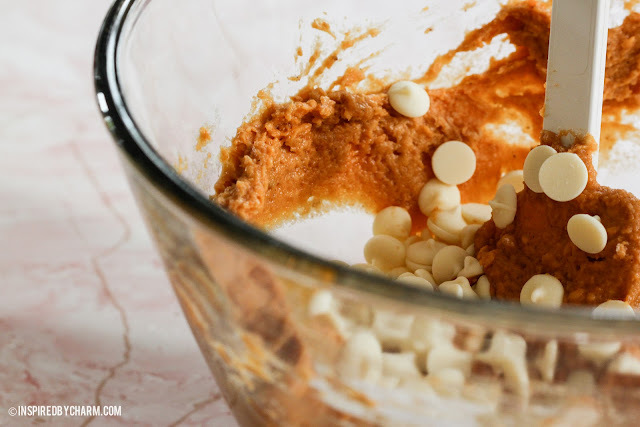 To brown sugar mixture, whisk in egg, vanilla, and pumpkin until combined. Slowly mix in flour mixture and stir until just combined. Gently stir in your white chocolate chips. Pour batter into pan. Bake for 20 minutes or until a tooth pick inserted in the middle comes out clean. Allow to cool completely on a wire rack. Sprinkle with powdered sugar and cut into desired serving size. Again, as you can see from the instagram picture above, the resulting blondies turned out just as fabulous as the first time. Light, fully, and full of pumpkin flavor! They took exactly 20 minutes to bake. My only thought as to why this may not be working for folks is because of the pumpkin. Be sure you are getting the smaller can. This is the 15 oz size as noted in the recipe. Make sure it is pumpkin puree and not pumpkin pie mix. Also, depending on your oven, you make just need to bake them a little longer. You’ll know they are ready when you insert a toothpick and it comes out clean. Thank you for all the feedback and I hope this addition is helpful to those that were having issues. Please let me know. Now it’s time for a giveaway. During my actual open house I’m giving away a basket full of locally made items, plus some of my favorite things from the shop. As I mentioned on Sunday, I wanted to include all of you as much as I could, so I decided to make two of these fabulous baskets. One I will give away to a visitor to my Fall Open House; the other I will ship to one of you lucky folks! Pretty amazing, right?! 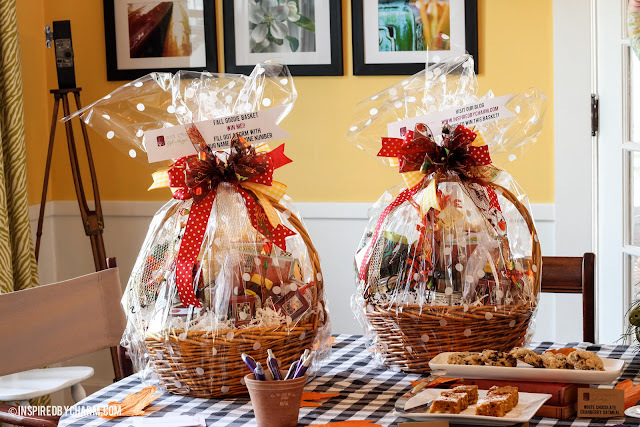 The value of each basket is estimated at $100. I think Rafflecopter worked pretty well for the Lost Crates giveaway so we are going to try that again. To enter you’ll have to answer a basic question about fall. Bonus entries are available for liking Inspired by Charm on Facebook and following Inspired by Charm on Twitter. The Rafflecopter widget will appear below this sentence. Please give it a few seconds to load. This giveaway closes Sunday, September 16, 2012 at 11:59 p.m. EST. This giveaway is open to residents of the US or Canada. 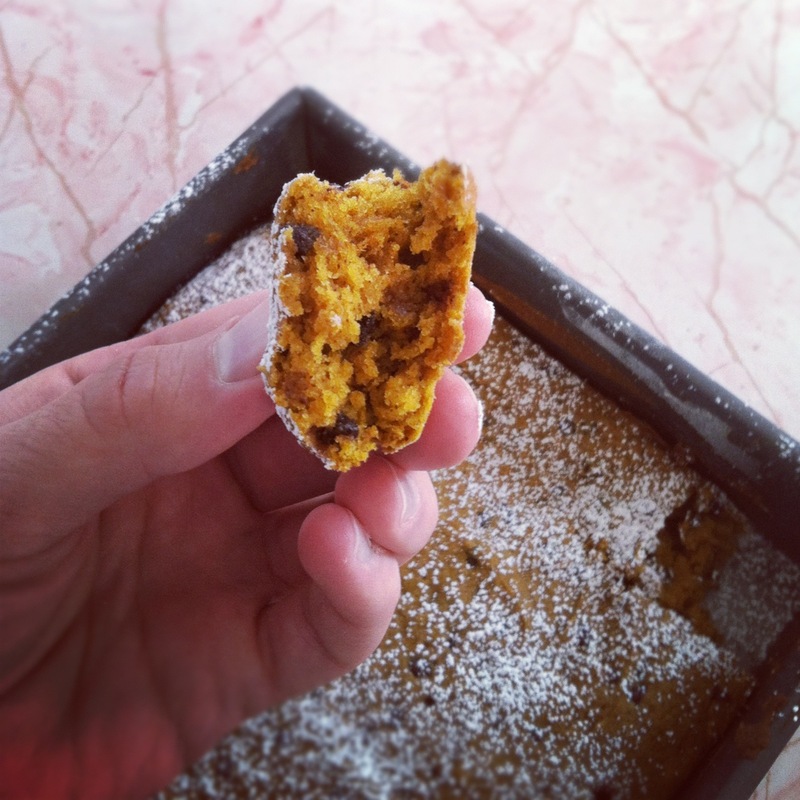 How much pumpkin goes into the blondies? I didn’t see it on the list of ingredients. These look amazing! 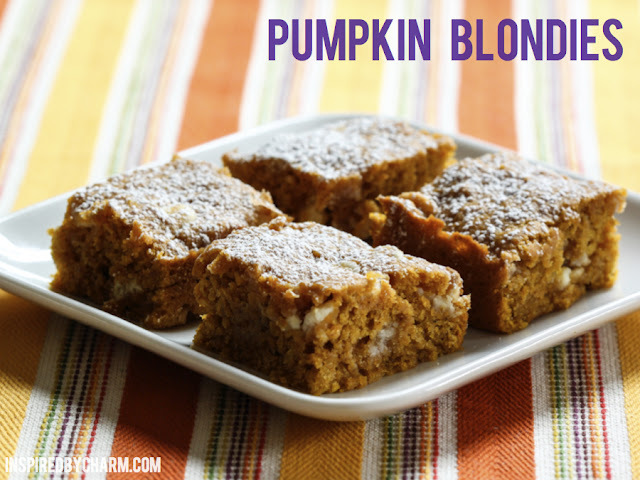 I love blondies and I love autumnal treats — perfect combination. Thanks for posting, Michael! You’re the bomb! Great giveaway and I love this recipe!! Pinning it! These “bar cookies” look delish!! Joy said … favorite things about fall … the colors and Thanksgiving foods. My favorite thing about Fall is the arrival of cooler, crisp temperatures! After sweating through the summer, I love to put on boots, jeans and a sweater without getting too warm. This recipe looks and sounds delicious! And I have everything it calls for in my kitchen…just might do this tonight! Yum Yum I can’t wait to make this recipe. My favorite thing about fall is the amazing food & cooler weather here in Texas! These look fabulous! I think they might be served here at our Thanksgiving lunch this year! 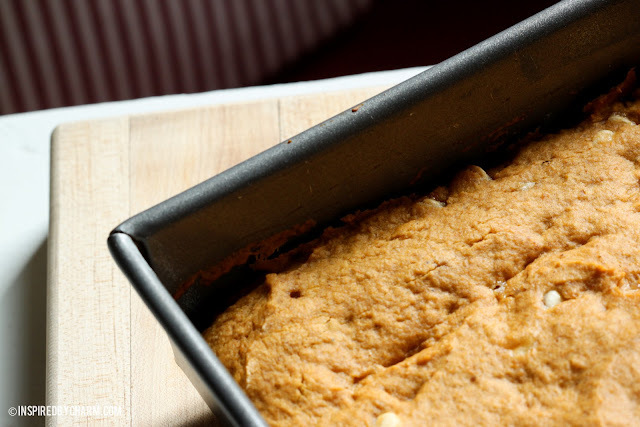 This looks like a fantastic recipe, pumpkin is one of my favorite things to bake with! I may try this and add cinnamon chips instead of the white chocolate, too. (If you ever bake with cinnamon chips, I’d recommend KAF brand, they are fabulous.) Adding a spoonful of pumpkin to a bowl of oatmeal is another fall favorite, delicious! My favorite thing about fall is…well…everything! It’s my favorite season. It’s so hot and humid and buggy here in the summer and the cooler fall weather is such a welcome change. I love blondies and these look yummy! Thanks for sharing! No words can explain my love of fall. I adore everything about it! It’s my favorite season. I’m going to make the pumpkin blondies today. Thanks, Michael! I’ll be making this recipe this weekend. One of my favorite things about fall is all of the great pumpkin recipes. Your baskets are beautiful anyone to receive one will be one lucky duck. By the way, I loved your coffee bar idea and just created one for myself this past weekend. It makes the morning cup of java just a little bit more special. Love your blog! awh Fall….love the cooler days, the colors, a fire in our very small but homey fireplace, a pot of hot soup and football! your recipes look wonderful! 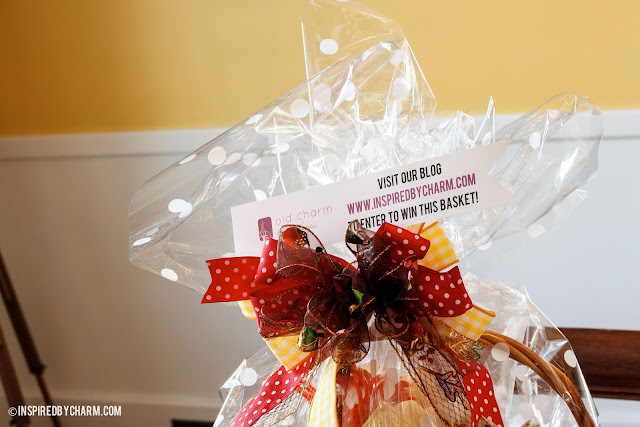 And the basket amazing! These looks amazing!!! Well done. Fall is a mixture of everything we wait all summer for – but in my mind, the thing I do love about fall are the aromas; walking outside you can smell that people have their fireplaces going, you can smell the house full of the smell of vanilla and spices and yo know you have delicious treats waiting. I also love that the evening comes earlier and we shut the curtains or blinds, sit down and relax together over a savory meal that has been in the crocpot. Fall to me is…all good. I was so excited to try this recipe…..and ended up very dissapointed. They turned out heavy and gooey. Is the recipe correct. It seemed like there was too much pumpkin and not enough flour. They didn’t bake up like I had to throw them away. Such a bummer Anonymous. I’m not sure what happened. This recipe worked out wonderfully for me. They were a hit at my open house. Maybe yours weren’t fully baked?? I’m not sure. Sorry I couldn’t be more helpful. I had the same problem with them being gooey and flat. Are they supposed to be a brownie consistency and rise like brownies do? I’m wondering if I just didn’t bake them long enough, or if maybe one of the ingredient amounts is off? I really want to give these another try, but I’m not good at the chemistry of baking, so I have no idea which ingredient could be off. Anonymous and Meggin – Sorry for your disappointment. I’m not sure what’s happening. This may be a dumb question, but are you using the right size can on pumpkin. You want the 15oz size, not the large can. Also, are you baking it long enough? It seems that some people had great success with this recipe. Looks like I’m going to have to give them a try again to make sure things are correct. I’ll report back. I’ve tried this recipe twice exactly as written and have been disappointed both times. They turned out flat and very dense/moist. Am wondering if the recipe needs more than just 1 1/2 cup of flour. I’m determined to get it right because your picture makes them look so good. Michael – thanks for trying them again – they look delicious! I’m pretty sure I used the right size can of pumpkin, but I’ll check on that. I’m going to make these again this weekend, and I’ll also be sure that I’m baking them long enough. I used the exact size of pumpkin puree and all the right ingredient amounts and the consistency is chewy, doughy and doesn’t look completely cooked. I baked them for 30 minutes because at 20 minutes, they were still not done in the center. The flavor is good, just not crazy about the texture. HI, I have to say that I tried this recipe on Sunday to take to a Fall picnic, I threw out the entire pan (which has NEVER happened to me before). I even read all of these comments first, had all the right ingredients, pan size, etc, but I had to bake it twice as long as 20 minutes and only the edges were cooked. I am in love with this recipe! Please don’t delete it! I did find that I had to bake it them a little longer ~28 minutes. I also used 1 cup white, 1/2 cup wheat flour (and upped the chocolate to half a bag). I have made them 3 times in the past month and I have received many compliments. Thank you for sharing! Mine were edible but I don’t think I’d make them again. They didn’t turn out very fluffy and I was careful not to overmix. They look awesome in your picture though! I also don’t think I got the desired product out of these, but they were still good. Mine didn’t really rise and were still very heavy and moist. They actually seemed more like pumpkin pie that you could hold in your hand. I want to try them again, but may use just a half can of pumpkin next time. 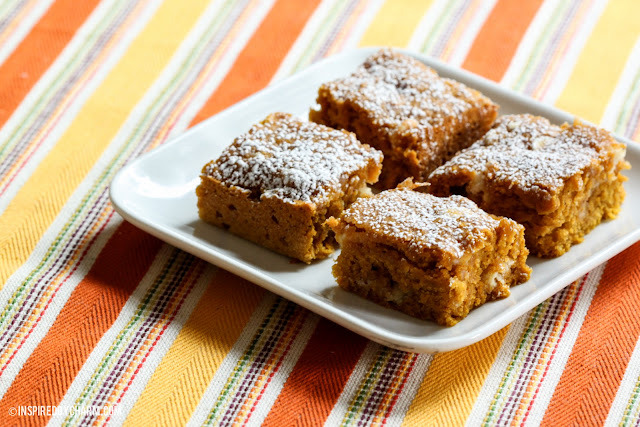 I just made the pumpkin bars and they came out great.I added another fourth cup of flour and two tbsp wheat germ.I baked for 20 min.Let them sit out about 15 min before I cut into them.They r moist and delicious! So we reas through some of the other comments abd made some modifications. Added an extra 1/4 cup of flour, two teaspoons of 2x vanilla (cause I always double hehe), and some pecans. Oh, and we used homemade kabocha squash purée which is very similar to pumpkin and baked for 35 minutes. These are amazingly good!!! Glad you left the post up! Fall is my favorite time of year. I used to iron many, many gorgeous fall leaves between sheets of waxed paper and mail them to my sister in southern California. She used to decorate her entire refrigerator with them. She has been gone a few years; I miss her and sending her those precious packages of fall New England leaves. I made the pumpkin blondies and followed all the instructions and they came out wonderful. I had no problem but i did leave in the oven for 10 min longer. Everyone loved them!!! !